The season was coming to an end and it was time to decide where to go next. As a globe-trotting diving instructor the world, it would seem, was my oyster. I came across a job listing “Underwater Photo / Video Pro needed in the Bahamas” The Bahamas featured in my mind as a string of jewel-like islands strewn across the glittering Caribbean Sea (which I later realised was not true. The Bahamas are actually too far North to be in the Caribbean, they are in the Atlantic.) Still, the Bahamas sounded perfect. Before I knew it I had landed at Nassau airport on New Providence Island (having been allowed in despite carefully rejecting the advances of the friendliest immigration officer I have ever met “Do you want a Bahamian boyfriend?” Umm, no, but thank you... (Will he let me in if I reject him? Eek!) They’re never that friendly when I land in the UK!) I found a taxi and with my dive gear, headed to the dive centre. The next day I was shown and talked through a few things and then asked casually “Oh, you’re ok with sharks, right?” Ok with sharks? I love sharks but it’s not like I knew any personally and knowing what I now know, I should probably have asked what type of sharks we were talking about, but said that I would love to do more diving with sharks. Was that the right response? Well, yes as it turned out. “Ah good. We’ll put you on the shark boat this afternoon,” came the response. I put my gear and camera on the boat and helped around 16 or so divers get themselves on the boat and ready to go. The fishy baitbox on the dock got warm and smelly. Thankfully some good sea air helped the smell dissipate as we made our way to the dive site where once we had moored up and turned off the engines shark fins started to circle the boat. The water was so crystal clear that nobody had any doubt we were surrounded by sharks, peckish sharks. We made a first dive without feeding anybody and everyone made it back to the boat in one piece. During our surface interval my colleagues gave one of the most intense dive briefings I had ever heard, basically explaining how not to get chewed. We geared up, which for me as dive staff involved dressing in some impressive chainmail, which was a first. 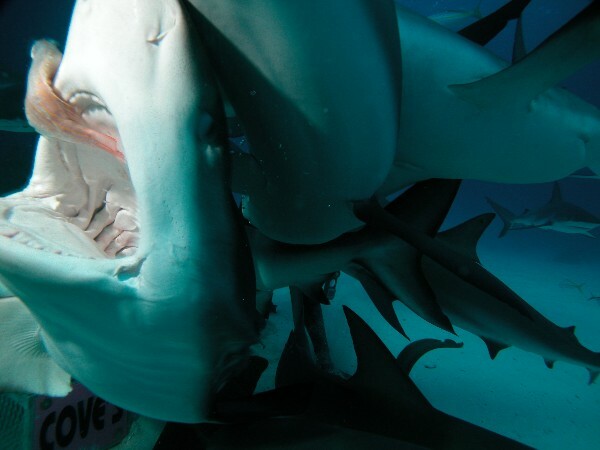 It makes sense that if you are going to stick cameras in the faces of sharks your arms are at risk. We photo staff got into the water which involved rolling backwards into what was effectively, by this point, shark soup. As I descended with my camera, one of the first divers to enter the water, I was surrounded by the sharks that swam alongside me, their glassy grey eyes keen on me as they swam with me, over and beneath me. They were so close I could have touched them, but they were staying cool, so I thought I’d do the same. As I stopped on the sandy bottom I remembered my camera and fiddled with the settings a bit. 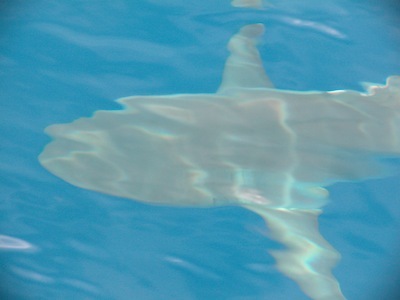 The sharks cruised slowly but fluidly around me. I could feel them checking me out. One by one the divers came and we positioned them in a circle to watch the feed, their eyes filling their masks. All of a sudden every single one of the sharks diverted and shot to the back of the boat above us on the surface. I later learned that signalled that the feeder and more importantly the bait had just hit the water. I fiddled with the camera again, still at the stage of not quite familiar with it and the cumbersome underwater housing. I saw the feeder swimming, well, struggling to swim towards us actually, with the heavy baitbox and keenly followed by about 30 very attentive sharks. I hit record and took a deep breath. Wow. I was kneeling on the sand, blissfully unaware at this stage that it is hopeless trying to balance on two knees against the centrifugal force of circling sharks, not to mention capture it on video. The sharks cruised around us. They swam very closely over divers’ heads and between people, their pectoral fins brushing against divers’ arms. The feeder suddenly indicated to me that I ought to come closer. Hmmm. I inched forward and then, sensing that this looked pathetic, crept forward a bit more. Back on the boat the divers were bursting with enthusiasm and excitement. Many had never seen sharks before, but I’d guess none had seen them at this proximity. I couldn’t help but grin. I loved my new job. 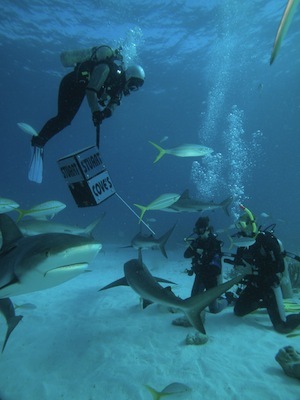 With daily shark feeds to photograph and video I quickly became very used to the sharks. I was able to identify individual sharks and looked forward to seeing if the scar on one had healed a bit or if another had got rid of a fishing hook caught in his mouth, complete with line. We would try to yank these out whenever we could as a circling shark trailing fishing line can lead to a nasty garrotting of the shark feeder. A rusting hook through your lip can’t be much fun either. I got used to the sharks swimming into me and tipping me over. I eventually perfected kneeling on one knee with the other leg out beside me as a balancer, but that meant more room for sharks to swim beneath me, which weirdly and often resulting in me falling about in fits of giggles, they did. Did I ever get bitten you’re wondering? Yes I got a bit chewed, but I was never seriously hurt. A chomp to my hand was sore, but more because the metal of the chainmail gloves sliced a mesh-like pattern into the not-very-fleshy back of my hand than due to the impact of teeth. And if you’re after comedy… Once on striding off the boat into the water I managed to catch a shark, which whipped around and bit me in the bum. Fair enough I say. I always feel aggrieved when someone steps on me. Do you want to dive with sharks? Go to the Bahamas; It is amazing.